Open Area 2 is judged to be bounded, at least in part, to the east and west by ditches 25075 and 25166 and to extend between the lower terrace edge and OA5. As such almost the entire extent of the enclosure may have been exposed within Development Area A2. However, the limited extent of its investigation, within Excavation Areas L, M and P, is noted. The enclosure interior is occupied by circular buildings, pits, a hearth and other miscellaneous fragmentary gullies and structural remains of apparent Period 2A date (Figure 8). The most enigmatic of these is pit 15417, which contains a deposit of pyre debris. 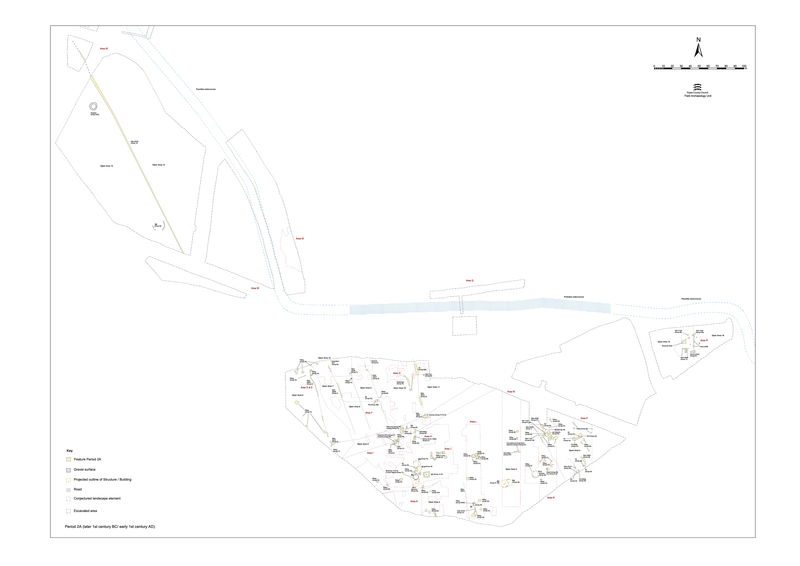 As well as being informative about the highly structured nature of the PRLIA funerary ritual, its presence serves to show that land-use activity of this date is potentially diverse in its nature across the lower terrace. The three buildings discerned are located toward the southern end of the enclosure, some 30-40m from the lower terrace edge. If indeed OA2 is a single cohesive entity, it is possible that it looks out to the salt-marsh and river to the south rather than inland over the terrace itself. This might help explain the siting of the pyre debris pit in what is effectively toward the 'rear' of the enclosure. However, the lack of investigation across the northern end of OA2 is noted. 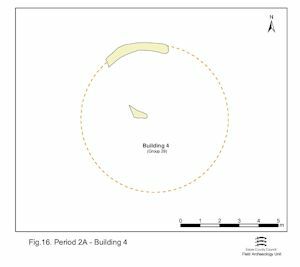 Roundhouse Building 3 is defined by a curving gully (24389/24400 Group 27) and small post-holes (24379, 24407, 24409 Group 28). 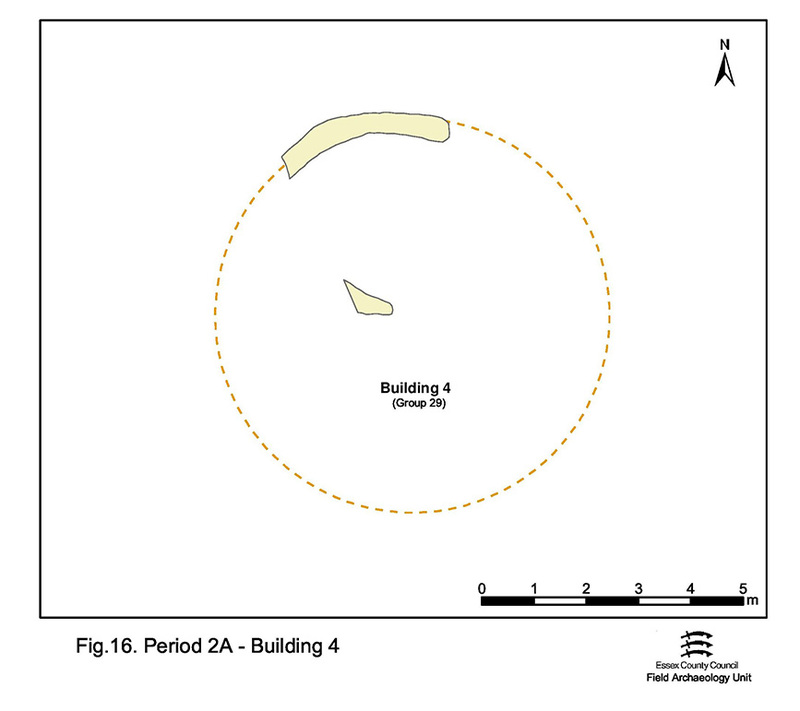 Only about one-sixth of the circumference of the building could be traced during excavation but pre-excavation plans show a further length of gully extending north (Figure 15). Any of the numerous post-holes within this very partial circumference could be associated. 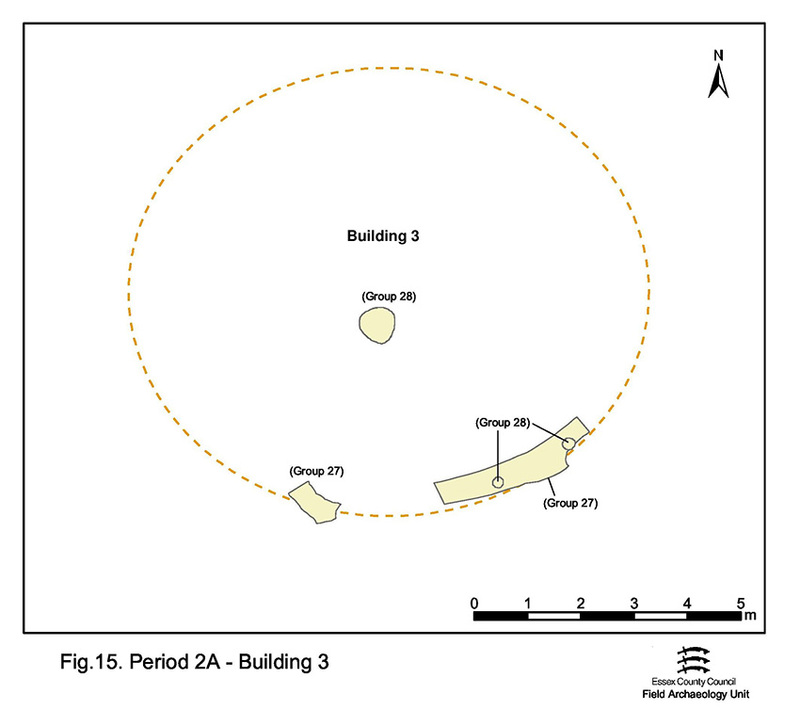 Post-hole 24379 may represent the location of a central upright of a building with a radius of c. 4m. The fills collectively contain only a very few sherds of LIA, mainly grog-tempered pottery, but a fragment of Central Gaulish beaker in post-hole 24407 provides an early 1st century AD date. This building must remain largely conjectural. Building 4 (Figure 16) comprises a slightly irregular penannular gully 24167 (Group 29), 0.40m wide and 0.10m deep, with a U-shaped profile. Its fill 24167 contains a small quantity of grog-tempered pottery, providing a Late Iron Age date. The site of Building 4 is cut by Period 2B enclosure ditches 25081/25082 (Group 146). As construed, the footprints of Buildings 3 and 4 intersect in plan but their sequence is undetermined. 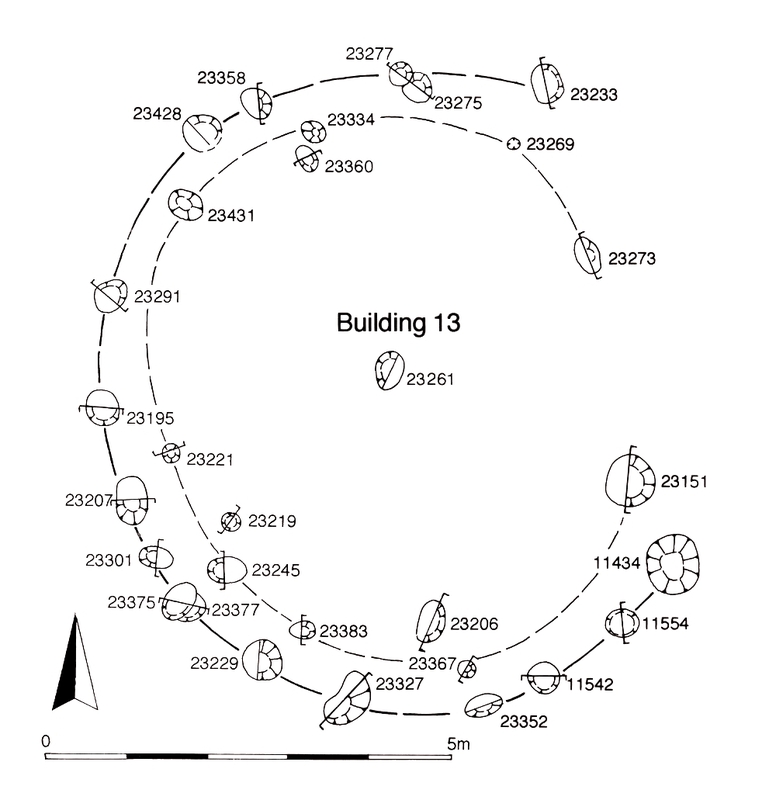 Building 13 (Figure 17) is located to the east of Buildings 3 and 4. The outer circumference is formed by 15 post-holes (three with signs of replacement), defining a roundhouse of some 8m diameter (c. 50m² floor area). An inner arc of eight more post-holes is less convincing than the outer and may not be relevant. The east side may have been obscured or simply not explored, or there may have been a real gap between 11434 and 23233 in the outer arc. Other posts in the interior area could represent possible roof supports, but are more likely to be unrelated. The post-holes are generally all of a similar size. 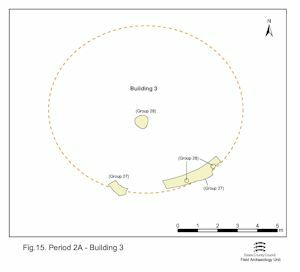 Five (11542, 23150, 23205, 23229, 23360) contain very small quantities of Late Iron Age and Roman pottery but do not provide clear dating, and it should be borne in mind that although Building 13 has been treated as lying in Period 2A, it may well have functioned into Period 2B. Much of the Period 2A pitting is seemingly located toward the eastern and western edges of the enclosure and at a distance from the rear of Buildings 3, 4 and 13. The finds from the fills of the more southern pits (23055, 23092, 23128, 23158, 23393 Group 31) are conspicuously limited in range and generally confined to pottery and small quantities of animal bone. However, 23158 contains a copper-alloy pin (SF7849). All are of late 1st century BC to early 1st century AD date and it is possible that their contents derive largely from the occupation of Building 13 to their west. The Period 2A pits located to the west of Buildings 3 and 4 (14355, 20144/20145 Group 32 and 14207, 14225, 14257, 20086 Group 36) include a variety of metalwork fragments, waste pieces and hammerscale together with quantities of grog-tempered pottery, daub, animal bone and items such as spindlewhorls. Lying close to Structure 5 and cutting the gully/drain running to its south, the Group 36 pits also contain small but significant concentrations of metalworking debris. Further pits in the vicinity of Building 13 (11508, 23038, 23113, 23148, 23413, 23422 Group 37), which can also be dated to the Late Iron Age by the presence of grog-tempered pottery only, are distinguished from those of Groups 31 and 32 simply because there is less definite stratigraphic evidence for their phasing (these features were classed as General Period 2 during analysis), and are not noticeably different from the more securely dated examples. Notably, pit 11508 is surrounded by a structure of six post-holes. Daub, which is the only find other than pottery from this pit, may derive from the fabric of a surrounding post-built structure. The northern pits underlie what later becomes the line of Road 3 (Period 2B). Large pits 20335 and 20489 (Group 43) contain further metalworking debris. Pit 20211 (Group 42) contains a silver coin (SF7473, a new type) of the 1st century BC. The lower fill of adjacent 20481 (also Group 42) appears to be significantly earlier than what may be a later capping over the top. It is probable that the capping represents consolidation of the pit prior to the construction of Road 3 (in Period 2B). Pit 15004 (Group 95), a large oval cut some 2m by 1.3m wide and almost 1m deep, contains a fairly typical domestic rubbish assemblage dominated by pottery but also includes baked clay, animal bone and a ceramic disc cut from a ?grog-tempered jar (SF4954). Pit 15818 (Group 237) of early-mid-1st century AD date lies immediately to the west of pyre debris pit 15417 (see below). While it contains a relatively substantial pottery assemblage, there is no evidence that it is in any way related to the pyre debris pit. A single hearth (Group 39), composed of a patch of cobbles 23018, overlain by a sequence of deposits of baked clay and charcoal layers (23063, 23064, 23065) is located just east of Building 13, preserved in the slump hollow of Period 2A pit 23055 (Group 31, above). Finds include tiny amounts of slag and hammerscale, briquetage and Late Iron Age grog-tempered pottery. It is possible that the hearth is used for metalworking, though the evidence is slight. 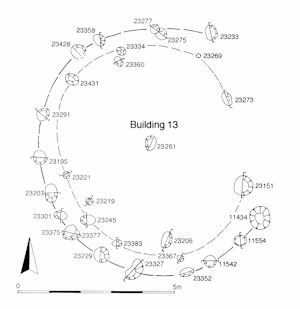 Pit 15417, located to the north of Buildings 3, 4 and 13, is distinguished both by its shape and by the finds assemblage from its upper fill (15416) which includes KPG5. 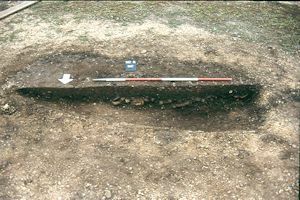 This large and elongated pit, 3.67m long by 1.7m wide, and 1.04m deep, with steep sides and a generally flat base, displays two distinct episodes of use (Figure 18). The primary fill occupies the majority of the depth of the cut and contains pottery and a few pieces of ironwork, including a punch (SF7413). Cut into the top of this deposit are nine small stake-holes (Group 34), filled with a yellowish-brown silty clay in clear contrast to the primary pit fill, eight of which could be construed to form the larger part of a rough circle in excess of 0.85m in diameter. The function of this stake-built structure is undetermined. A very different deposit, 15416, is laid down in the hollow over the primary fill, perhaps after the removal of the stakes. A large quantity of broken and burnt pottery is deposited in the pit, which is then finally backfilled with a mid-brown sandy silt (15490=15418), containing a puddingstone quern fragment (no SF number), iron rod fragment (SF6649), briquetage and metalworking mould fragments. Amphora sherds are the only pottery present, which probably in fact derive from 15416. The deposit of broken and burnt pottery is, by far, the most significant aspect of this feature and the key to understanding its function and importance. It includes an unusually high proportion of fine wares, together with the remnants of at least three amphorae. The fineware, which includes fragments of platters, beakers and jugs, mainly imports, constitutes the remains of a table service and the Dressel I amphorae indicate the consumption of wine. The presence of further vessels of coarseware - jars and beakers, a mortarium and a bowl - perhaps represents the inclusion of preparation vessels, but are as likely simply to be less prestigious tableware. Almost all of the pottery is burnt, the heat causing their severe fracture and/or distortion. In addition to this pottery component, 15416 includes baked clay, mould fragments, briquetage, and a copper-alloy object (SF6639). All but the latter are thought to be incidental to this deposit and perhaps in fact derived from the overlying backfill 15490=15418. A flint scraper (SF6107) is presumed to be a residual inclusion. The pottery is almost certainly that part of the pyre debris left following the selection and extraction of material to be incorporated into the grave itself (assuming that there was a body present to make a formal interment worthwhile). This is not to say that the deposit is merely discarded waste; 15416 may well be the product of careful selection and possibly some accompanying ritual. Further consideration of this deposit and its implications is made in Atkinson and Preston (2015). Purely as a landscape feature, pit 15417 is probably not particularly special. However, on receiving deposit 15416 it attained and, possibly, subsequently retained an influence on land-use in the vicinity. It is noteworthy that this feature is never encroached upon by later features. 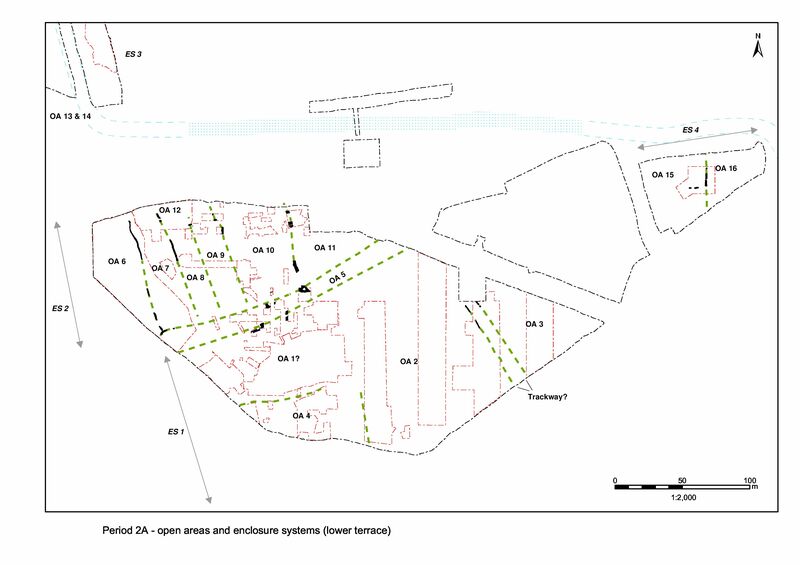 Considering the high density of pitting over much of this part of the LIA and Roman settlement, particularly in the immediate vicinity, it is possible to suggest that some memory of its location was maintained and that the feature was respected for some considerable time. It is tempting to identify undated post-hole 15511 (Group 34), which just clips its western edge, as the remains of a marker post. In addition, there are other undated post-holes in the vicinity which could equally be associated. The pottery assemblage from 15416 is dated to c. 10 BC-AD 5, the earliest secure date from this part of the site. This does not imply that this feature was isolated, but, rather, leads to questions about the dating of smaller, less distinctive pottery assemblages. A cluster of features is located to the south-west of Buildings 3 and 4. Structure 5 (Group 40) is pre-dated by pit 14488/14515 (Group 35), whose fills are dated to the Late Iron Age by grog-tempered pottery. 14515 and 14496 are regularly positioned post-holes set into this pit (NB.14496 Group 38 was treated as a discrete Period 2B feature during analysis). Structure 5 comprises two short lengths of similarly proportioned (0.75m wide and 0.35m deep) gullies 14402 and 25142 (seg. 14331) set at right-angles to one another. The full extent of neither is established, both being truncated by later features. Smaller slot 14000 probably represents the eastward continuation of the line of 14402. Narrower slot 14434, alongside 25142, would also appear associated. These are tentatively interpreted as defining the corner of Structure 5, which therefore measures least 5m by 4m. Grog-tempered pottery recovered from the gullies provides a Late Iron Age date. Curving gully 25144 (seg. 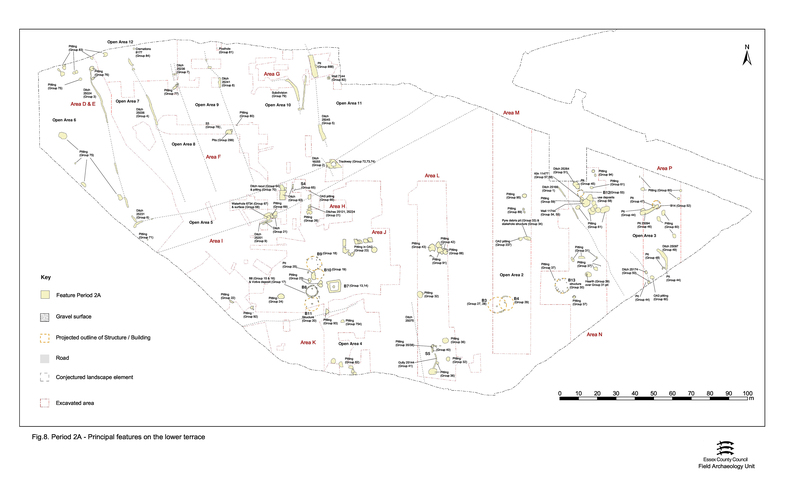 14350) is located with the pits and Structure 5 that occupy the south-west corner of OA2. Traced for 8.5m, a rounded terminal is defined at its north end, but no south end determined, owing to truncation by Period 2A pit 20086. Although 0.35m deep, its width of 0.4-0.5m and an absence of integral post-holes along its length suggests that it is unlikely to be a structural slot. A drainage function is presumed, possibly related to Structure 5. Pottery dates its infilling to the late 1st century BC-early 1st century AD.